The events of the past three months threw a stark light on the way the AKP government and Gülenists used the justice system in the past for common political ends. The result has been a clear erosion of the rule of law. Turkey’s voters deserve better than that. Turkey’s local elections on March 30, among the most contested in recent times, felt more like a referendum on the Prime Minister Recep Tayyip Erdoğan than a poll for municipal government. The terms of the contest were defined by the unprecedented political fight between Erdoğan’s Justice and Development Party (AKP) and its former long-term ally, the Gülen movement––followers of the US-based cleric Fethullah Gülen. Erdoğan claimed victory in the face of the huge corruption investigation implicating key cabinet members and Erdoğan’s own family. He rejected the accusations, accusing the Gülen movement of being behind them and of being a “parallel state” involved in an international conspiracy to bring him down. Erdogan’s domestic triumph came with heavy costs. The casualty of the political fight and combative election campaign period has undoubtedly been the rule of law and the prospect of Turkey having an impartial and independent judiciary. The downward slide on human rights in the country has been going on for several years but came to the attention of the world with the clampdown on the Gezi park protesters last summer. During the election campaign the government took every step imaginable to bury the corruption scandal and impede the criminal investigation. Leaked wiretaps purporting to be senior government figures and aides’ telephone calls suggest that the prime minister’s office flagrantly intervened in the corruption investigation. The prime minister has not questioned the content of these calls or the identity of the speakers, though has issued vague denials to the effect that they are “montage”. Thousands of police and scores of prosecutors and judges the government perceives to be Gülen followers have been demoted and rotated. The government brought the main institution responsible for the judiciary, the High Council of Judges and Prosecutors, under its tighter control through a new law and by purging and rotating its members to minimize Gülenist influence. It introduced a more restrictive internet law, and after corruption allegations emerged on Twitter and YouTube, blocked access to both sites in Turkey. All of this has damaged Turkey’s credibility internationally, with the EU, the US, the UN and Council of Europe raising strong concerns about judicial independence, the internet law, and the actions against Twitter and YouTube. The extent of Erdoğan’s popularity and the reasons why his party commands such support are not well understood outside Turkey. 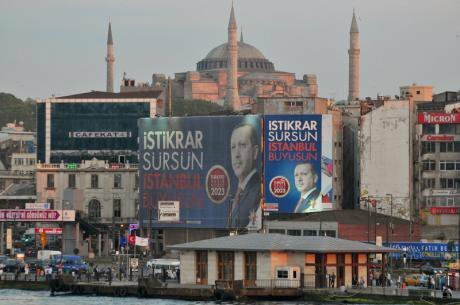 Beyond the decisive factor of the prime minister’s charismatic leadership, many people in Turkey identify strongly with the AKP’s Sunni Muslim religious colouring and provincial roots. Equally important, they see the party as having brought prosperity, better services and a greater share of the pie for more people. The AKP also has an unrivalled capacity to project that image and send out populist messages through control of much of the media and public space, while increasingly playing the Sunni Muslim identity politics card. It isn’t so much that AKP supporters don’t believe the corruption allegations, but rather that they do not feel particularly threatened by them in the present economic climate. While the stock market and currency have been affected by declining international confidence, the real economy continues to grow despite a slowdown. The lack of a credible opposition party in Turkey is the other major factor. 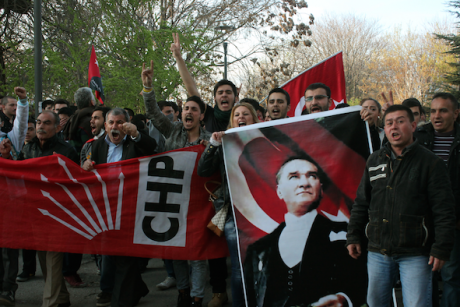 Historical memory of the main opposition Republican People’s Party (CHP) as a party without popular reach, except for a brief period in the 1970s, is a recurring theme. Moreover, the AKP retains strong support from Turkey’s increasingly educated new middle class. Among AKP critics and direct opponents there are those who want politics and governance in Turkey to be conducted in a more democratic way. The best of the Gezi protests was just that: a manifestation of a youth movement with expectations for a more active model of citizenship and an end to the political tradition that has run throughout the history of the Republic of top-down decision making and imposition of the political class’s values and life-style (whether old Kemalist secular-nationalist or AKP religious-conservative). However, the CHP has not been able to respond to this or to renew itself by ridding itself of its inward-looking nationalist baggage and offering a more participatory model of politics. The AKP government meanwhile successfully managed to portray the Gezi protesters to its own constituency as immoral, unruly hooligans. The combative mode of the ruling party has contributed to an intense climate of polarization in Turkey. The AKP’s refusal to recognize the rights of Muslims who are not Sunni is further evidence of its divisive approach. Alevis make up 15 percent of Turkey’s population. But this government, like all previous governments, does not officially recognize their distinct identity or give their places of worship (the cemevi or meeting house) equal status in law with mosques or churches. Alevis have been shut out of AKP patronage networks and jobs that can bring social mobility, leaving them economically marginalized. AKP billboard in Istanbul. Demotix/Pascal Saez. All rights reserved. The AKP’s attitude toward the Kurds, Turkey’s other large minority group, has been more positive, with the government’s commitment to maintaining the year-long ceasefire with the Kurdistan Workers’ Party (PKK) and unprecedented gestures toward recognizing Kurdish identity over a longer period. The pro-Kurdish Peace and Democracy Party (BDP) and Peoples’ Democratic Party (HDP) have come out of the election stronger in the southeastern part of the country, with more chance to bargain with the ruling party to turn a ceasefire into a full peace process. Where all other opponents of the AKP feel they are being kept out, paradoxically the group that has been the most excluded and disenfranchised – with hundreds of its key political activists still in pre-trial detention – feels that it is a contender in the political game with everything to win. Erdoğan’s election victory speech in the early hours of March 31 has been widely criticized for signalling more readiness to take revenge on the Gülenists and other opponents than to reach out to the whole country. “We will walk into their dens,” the prime minister threatened in that speech. In the atmosphere of mistrust after the election, there were protests following the discovery of burned ballots in one town in the southeast, accusations of irregularities in many other places, and recounts in several towns. Riot police violently dispersed AKP opponents protesting the results of the vote in Ankara, where the AKP and CHP ran neck and neck. The events of the past three months threw a stark light on the way the AKP government and Gülenists used the justice system in the past for common political ends. But the response of the government to the corruption allegations and alleged capture of the judiciary by Gülenists has further weakened judicial independence. The result has been a clear erosion of the rule of law and increasing public mistrust in the possibility of an independent and impartial judiciary. Illegal wiretapping of government ministers and their families (and many others) runs entirely counter to the rule of law. And the timing of the corruption operation was clearly designed to discredit Erdoğan in the run up to the election. But the content of the wiretaps and the government’s response to the investigations into them have laid bare its own contempt for the rule of law. In one call, Erdoğan personally presses the then justice minister to get a court decision relating to an anti-government media boss reversed. In another Erdoğan’s then undersecretary instructs a governor to have a journalist arrested and imprisoned (it was thankfully not acted upon). In a third, the same undersecretary orders a police chief to disregard a prosecutor’s corruption investigation and boasts that the ruling party can simply change the law as needed. There has been no official denial that these particular calls were made by the individuals concerned. There is a long history to this and perhaps it’s good that the evidence is out in the open more clearly than ever before of how the judiciary is politicized and how laws and court decisions are a barometer of the political conjuncture. If you were among the many thousands standing trial for terrorism or other “crimes against the state,” it was always more rational to focus on the intentions of the government than on the ins and outs of challenging evidence in an indictment against you. Politicized mass trials with multiple defendants – including the continuing trials of Kurdish political activists and anti-government coup plotters – proliferated from 2007 on. In a system without strict adherence to due process or sufficient scrutiny of evidence, in which the police charge sheet, prosecution indictment and judge’s verdict are often indistinguishable, defendants have often been incarcerated for the duration of proceedings running over many years. Visiting delegations of lawyers from European bar associations would emerge from court hearings of Kurdish political activists puzzled by lawyers’––and even the court’s––minimal interest in legal arguments. There is every reason to think that both the government and Gülenist prosecutors and judges had a hand in these unfair and politicized trials, in which it was often impossible to distinguish whether there was solid evidence of criminal wrongdoing or simply a motivation to lock up political opponents. In the wake of the political fight between the government and the Gülenists, and motivated primarily by an effort to rid the system of Gülenist influence, the government has begun to dismantle the abusive system that oversaw these mass trials. While for years the ruling party toyed with judicial reforms through minor changes to laws, political expediency has this time made for much more sweeping changes. Potentially important––and positive––steps taken include abolishing special courts where terrorism cases were heard and sending all the continuing cases to regular criminal courts. The maximum period of pre-trial detention for those on trial for terrorism offenses and crimes against the state has been reduced to 5 years, from 10. Although 5 years pre-trial detention exceeds reasonable human rights norms, at least courts have starting granting bail to suspects in some cases on grounds that the new 5-year limit had been exceeded before a final verdict. That includes the dozens in the Ergenekon trial who are accused of plotting a coup and 45 Kurdish political activists and journalists on trial in Istanbul. Many more remain in pre-trial detention, however, in the southeastern part of the country. The impact of these steps could be enhanced if the government were to commit itself to further judicial reform to ensure fair trials, an approach to criminal law that in all cases is truly about considering the merits of evidence of criminal wrongdoing, and a much more proportionate approach to criminal charges and sentences. Key to this would be to amend abusive, vaguely worded anti-terrorism laws that have repeatedly been used against people who have not plotted or committed violent acts, incited violence or provided logistical support to armed groups. However, there are strong grounds to doubt this will happen in a climate in which a defensive AKP focused on maintaining political power has been taking these steps for political reasons while perpetuating a culture of impunity and lack of accountability. Against the pattern of rigorously pursued politicized trials against government opponents, human rights groups have for years documented the reverse when it comes to public officials and members of the security forces suspected of serious misconduct or human rights abuses. Most cases never got to court, and when they did, there was a range of ways of evading justice: defendants disappeared or didn’t show up at hearings, their cases limped on for years, the sentences were minimal, were suspended, or the whole proceedings were timed out under statutes of limitations. There have been almost no effective investigations into the police for the violent attacks on the Gezi protestors seriously injured in the events of last summer. In the case of the December 17 corruption investigation, the signs are not good. Although four government ministers were forced to resign, contrary to normal practice, courts have swiftly granted bail to their sons and all the other suspects under investigation for a string of very serious offenses before the criminal investigation was complete. The four ministers implicated in the case have parliamentary immunity but the government has prevented the evidence against them being read out in parliament, and it is uncertain what will happen to their case if it is consigned to a parliamentary sub- commission out of the public eye. In these circumstances, there is little possibility of an effective and impartial investigation capable of delivering justice. Rather than committing itself to overhauling the justice system to make it effective, independent and impartial, the government has chosen to increase political control over the judiciary. After a rotation of suspected Gülen supporters from the High Council of Judges and Prosecutors, the ruling party swiftly proceeded to change the law to tie the body more closely to the executive. In a move that violates the principle of the separation of powers, designed to safeguard judicial independence, the justice minister was granted much greater power to intervene in the council and to initiate disciplinary investigations. This is a bad sign. All in all, the indications are that Erdoğan and his circle would prefer to be above the law. On April 4, the prime minister gave his reactions to the Constitutional Court’s ruling that the government’s blocking order on Twitter constituted, “a serious intervention in freedom of expression” and should be immediately lifted. He commented that though abiding by the court ruling, that didn’t mean they had to respect it. He said he thought the ruling was not patriotic, ran contrary to “our national values,” and emphasized that Twitter was an American company. The implication is that the Turkish government has different standards when it comes to free speech. Playing the populist nationalist card with a strongly moralistic tone is an easy cover when you’d prefer to ignore the rule of law. Turkey’s voters deserve better than that.